LOL! Let’s play I spy! Yep. There it is! If you haven’t noticed it in 6 months it isn’t a mistake! Aren’t you glad it don’t make you want to rip it out? 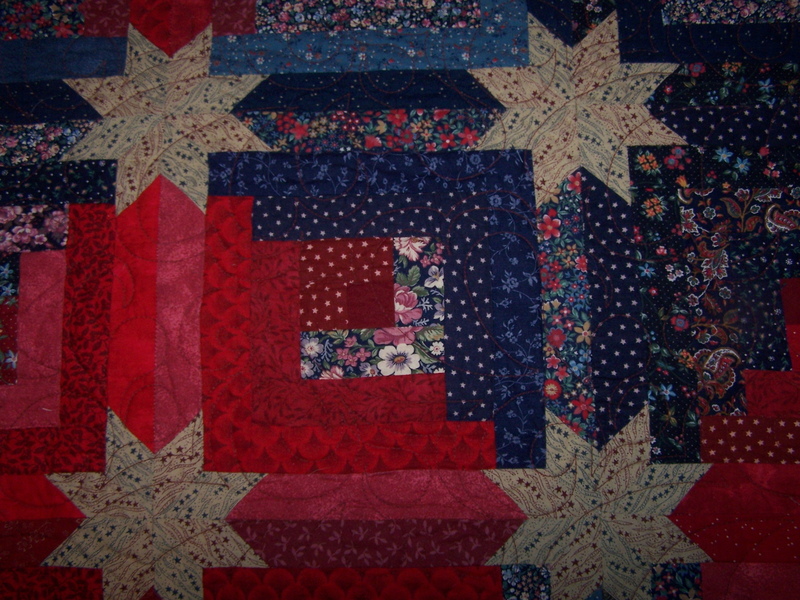 I put my boo boo quilt on my blog if you would like to check it out. It is amazing! Our eyes see what we want them to see when our hearts say “I’m done with that”! I love it! Well it took me a minute to find it! That’s the kind of thing that always show visitors and make them fine the mistake. This is also where blogging comes in handy. 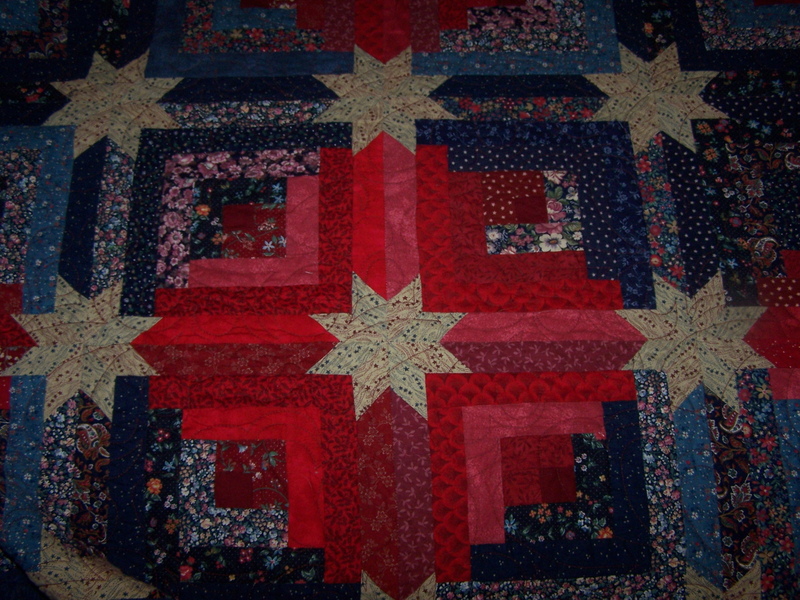 If I post a photo of a completed quilt top someone will usually find an error so I can fix it before I quilt it – or not! I just noticed a tie in that wasn’t buried on a quilt. The quilt has been on my bed on and off for 11 years!!! It would be a block that has a lot of white in it too! It’s a good reminder to try to step back and look at a quilt before quilting it. I’ve done it too! Oh, well. It’s a gorgeous quilt. I just realized I made that quilt a lot of years ago. It’s a ton of work with all the set in stars. I’d really like to make it again though! That little errant red square is just a bit errant! 🙂 Nonetheless, it is still a very beautiful quilt!!! I love all the different fabrics in there. It’s not a mistake……a design element…… Very great looking star log cabin. As my mother would say, only God is perfect. So if anyone asked you did it on purpose. I agree that the quilt is beautiful as is! I couldn’t see it either until I read the comments and knew what to go look for. 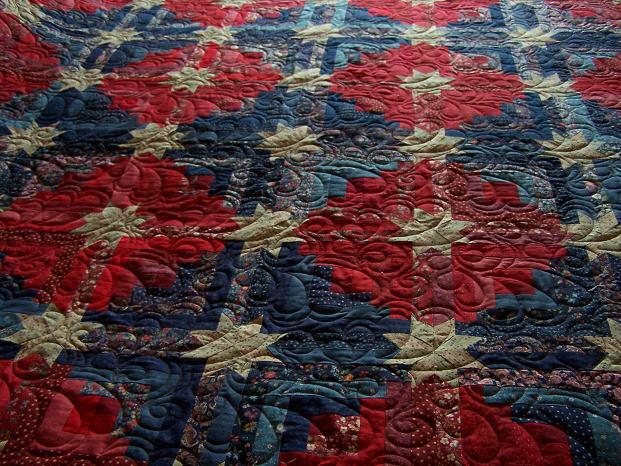 It is such a beautiful quilt. Don’t ya just hate it when that happens???? Pretty quilt Randi! I looked and looked…finally spotted it, but most people won’t see it. I love it! !